Bold and beautiful, the Horizon Hues Bouquet is set to send your sweetest wishes to friends and family across the miles! 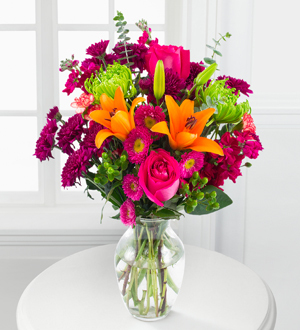 Picked fresh from the farm, this eye-catching bouquet brings together brilliant orange Asiatic Lilies, hot pink roses, magenta gilly flowers, green spider chrysanthemums, orange mini carnations, hot pink matsumoto asters, purple poms, green hypericum berries, and baby blue eucalyptus to create a stunning fresh flower arrangement. Presented with a classic clear glass vase, this bouquet will make an excellent birthday, anniversary, thank you, or get well gift.